Read about all types of painting classes in New York, and find one that best fits your budget and your schedule. Exercise your artistic desires by signing up for any of these wonderful painting lessons in New York. 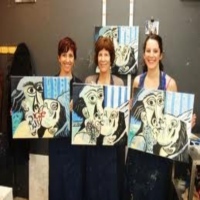 Some of the Best Painting Classes in NY! Express yourself freely and reinvigorate your creative spirit at The Art Studio NY! As New York City's # 1 art school, The Art Studio appeals to all ages and levels. 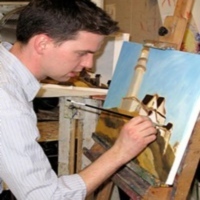 The studio offers beginner, intermediate, and advanced painting classes. Each student receives the one-on-one guidance he or she deserves. All classes and programs are taught by professionally acclaimed artists. Included in the schedule are group and private art classes, BYOB Cocktails and Creativity Painting Party classes, 1-Night Painting Classes with Wine, watercolor classes, and art retreats. The Art Studio NY also hosts private events like birthday parties and corporate events. Enjoy Painting And Learn The Techniques To Be An Artist! Painting can be a hobby where you get to enjoy creating beautiful images and a way for you to explore with your imagination. National Academy School of Fine Arts in New York offers the best training programs and workshops for you to learn and enhance your skills in painting. With its complete facility and world class instructors, you will be trained by the best in the business you will become a skillful artist. 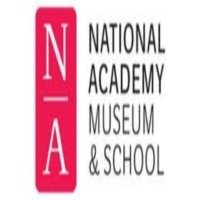 National Academy School of Fine Arts is the place to learn creativity and explore the different wonders of art. Enroll today at National Academy School of Fine Arts, where you will become an expert artist. Learn The Many Techniques Of Painting! Painting is an art of expression, where you get to create beautiful images that mirror your imagination and emotions. 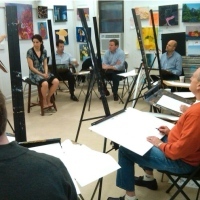 Here at The Art Students League of New York, they offer workshops and paint classes, where you are taught the methods and techniques in painting. Utilizing different media and styles of painting, you will learn your way in enhancing your skill in painting. Creativity and imagination is highly encouraged in the academy, for it is a way for you to make the perfect masterpiece. So visit The Art Students League of New York, the city's renowned art school, where you will be trained by the best that New York has to offer. Express Yourself Through The Art Of Painting! Art is a way of expressing your artistic statement and a way for you to show creativity and uniqueness. Fabrizio Art Studio opens its doors in providing painting classes, you will be trained in utilizing painting mediums, water color, oil painting and acrylic. It is a place where beginners and experts come to hone their skills in the art of painting, it is where they can learn to mirror their imagination and let creativity set in. Register today at Fabrizio Art Studio, located on the east side of Manhattan within walking distance of museum mile. So visit the studio today. 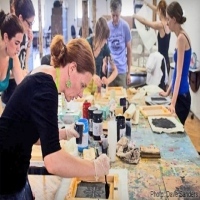 Learn Art With The Best In New York! Painting is an art where you can express yourself and create with your imagination something unique and something beautiful. Casey Inch, a veteran and talented painter, offers private painting classes in New York, where he will teach you the techniques and the ways of painting. You will utilize different methods of painting such as water color, oil paint, acrylics and many more. So call Casey Inch today for a private art class and gain a lot of skills and learn many methods of painting. 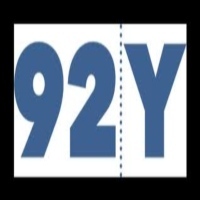 Learn And Enjoy Painting With 92nd Street Y! It is a place for adults and children to learn new skills and polish old ones, also a place for recreation and fun. 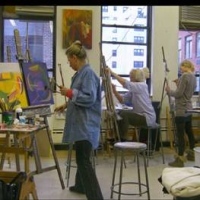 92nd Street Y offers painting classes in New York where you will be mentored by highly skilled and expert artists. It is a place for beginners to learn to love art and most especially painting. They will be trained in the techniques in creating a masterpiece. 92nd Street Y is open to everyone who wishes to learn the arts and a way for meeting new friends who have the same interests as them. So enroll today at 92nd Street Y and enjoy the amazing experience. Learn To Love Painting In New York! It is a great way to relieve you from all the stresses of the bustling city of New York. Painting helps you become more imaginative and creative, where you can express yourself through art. Here at Wet Paint Art Studio, they offer painting classes open for everyone who wishes to learn painting. 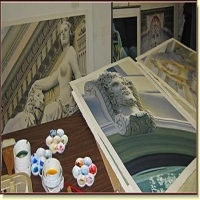 They offer introductory courses for beginners and teaches them the basics such as color mixing, the theories that apply to painting and the techniques such as oil painting. So learn to love the art of painting with New York's finest art studio and be inspired to create a work of art. The Painting Lounge, A Place To Learn To Love Painting! The Painting Lounge is a place where you can just relax and have a stress free painting class. It's a BYOB paint class where you can just relax while creating your masterpiece. For beginners, you will be taught the basics and progress your way to the complex techniques of painting. 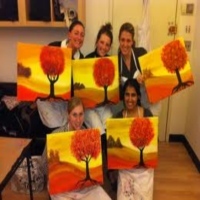 So have fun and enjoy painting at The Painting Lounge. It is a place to be in New York, where you can meet new friends and a place to relieve you from all your stress. Enroll today at The Painting Lounge and learn to love painting. Learn The Beautiful Art Of Water Color! Michiyo Art Studio offers water color lessons, where guests will be taught by one of the best water color artists in New York, Michiyo Fukushima. Renowned for her spectacular water color painting, she was featured in several magazines in New York and Japan. Her studio is a place for beginners to hone their skills in painting and to learn the basic principles of water color. Also, it is a place for people who have experience in water color but who need practice in order to perfect the art. So learn the beautiful art of water color with Michiyo Fukushima. Visit Michiyo Art Studio located in Tribeca New York. Make your reservations and contact the studio by phone or visit the website. Dive Your Way To Fun And Excitement And Create Your Work Of Art! New York's place to be for creating your work of art, Paint Along is a place where you can learn acrylic painting and at the same time enjoy and have a great time painting your masterpiece. You can bring your buddies along and enjoy the art class together. It is where creativity is ignited and imagination sets in. The session is a BYOB type of class, so you can bring any of your favorite beverages along and drink at the same time as you paint. So come to Paint Along and meet new friends and enjoy great company. It is a place where you can share ideas and learn from others. Live A Colorful Life In New York! 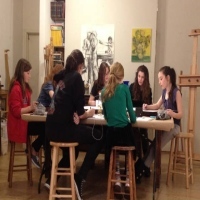 It is a place that offers affordable and definitely amazing art workshops, where students will be trained by professional artists of New York and become a good artist themselves. Brooklyn Art Space is the place to be for learning how to paint using different mediums and techniques. The studio offers many courses to choose from like abstract painting, acrylic, encaustic, oil painting just to name a few. So register at Brooklyn Art Space and choose which type of workshops and art styles interest you. For more details and schedules of the classes, please visit the website.